Create a WSO2 Worker-Manager Cluster in Just 2 Minutes ! - ASK Online ASK Online ASK Online: Create a WSO2 Worker-Manager Cluster in Just 2 Minutes ! Create a WSO2 Worker-Manager Cluster in Just 2 Minutes ! I've been working on an application(WSO2 Cluster Wizard) which creates a Worker-Manager Separated cluster for a given WSO2 Product. 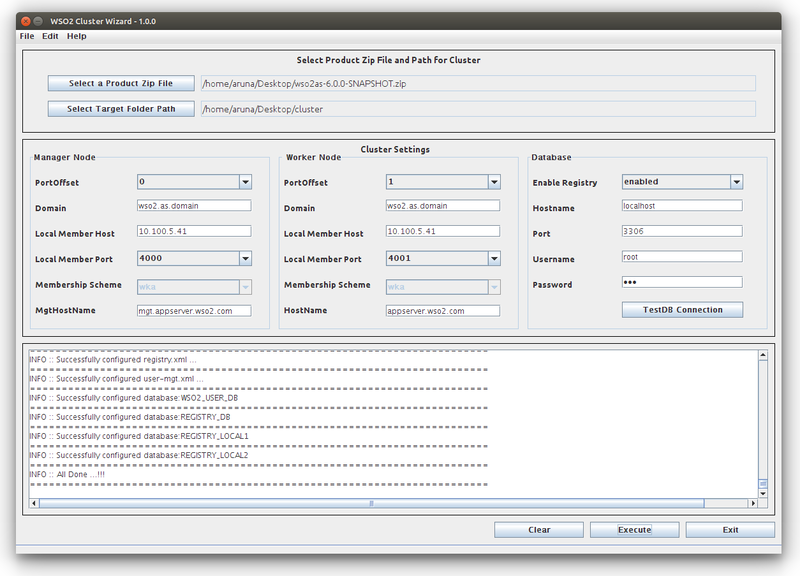 The objective of this application is to reduce the time spent on creating clusters in developers/testing local machines. Though puppet scripts can automate the process AFAIK, no one uses puppets to create clusters in their local setups'. This is a simple GUI application which is very easy to use. Here is a screen shot of the UI. In the next version I'll be hoping to add the WSO2ELB configuration support also. Change the worker's /repository/conf/user-mgt.xml value to jdbc/WSO2UMDB Other wise tenants don't get sync.